”My job is very computer-based, and pregnancy made my eyes more tired than usual,” says Sonia Ng, MD, a mom of two sons and a pediatrician and expert in sedation at Children’s Hospital of Philadelphia Pediatric Care at Princeton Health Care System in Princeton, NJ. “Looking at the computer screen also gave me dry eyes. What helped was using preservative-free Systane Lubricating eye drops in my eyes,” Dr. Ng adds. “I use the preservative-free drops because I’m allergic to the preservatives. The one time I used drops with preservatives, my eyes turned really red like I had pinkeye. When you work in a hospital and your eyes are red, swollen, and gunky, people really don’t want you to touch their children. 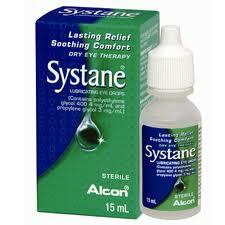 You can buy Systane Lubricating eye drops in drugstores and online for around $10.